Number 3 already! 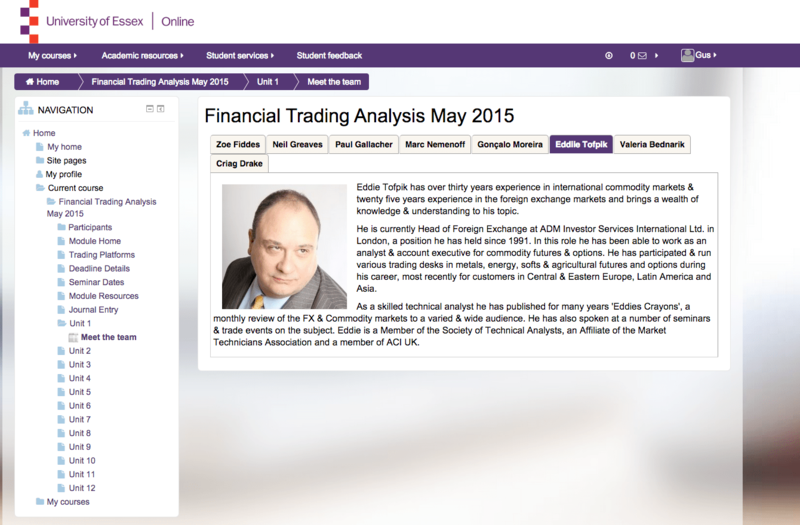 In late August, the 3rd intake of our Financial Analysis Trading course will take place. The Financial Trading Analysis (FTA) course is a short Masters-level introduction to finance for individuals who have an interest in risk management and trading and want to learn about financial markets and how they operate. It has been developed by FXStreet for University of Essex Online. Gus Farrow – Leader of the course. Gus was interviewed by Jeff Patterson from Finance Magnates, about how the project was born and developed. “One great thing about working with the University of Essex Online is they already had a masters and MBA program which students can progress onto.” Read the article. Gus also presented a 45-minute webinar about the course, and it was recorded. So if you want in-depth details about the FTA course, what he will teach you, who will be the teacher and how the course is organized, just watch the video. Deadline to apply for the 3rd intake is August 13th, 2015.